Aircraft Maintenance Engineering course (AME), is a license course approved by the Director General of Civil Aviation (DGCA), Govt. of India. The course is organised in 2 years, the students are required to complete their DGCA Modules whether B1 or B2 at the earliest. With the recent FDI policies favouring Civil Aviation, Skill Development initiatives and Make In India programmes, the opportunities in the Aviation sector has increased. Directorate General of Civil Aviation authority issues certificates of Airworthiness to all aircrafts which are in fully serviceable condition at all times. To certify an Aircraft as "Air-Worthy"; maintenance, repair and overhaul is carried out on aircrafts periodically and it is made fully serviceable. 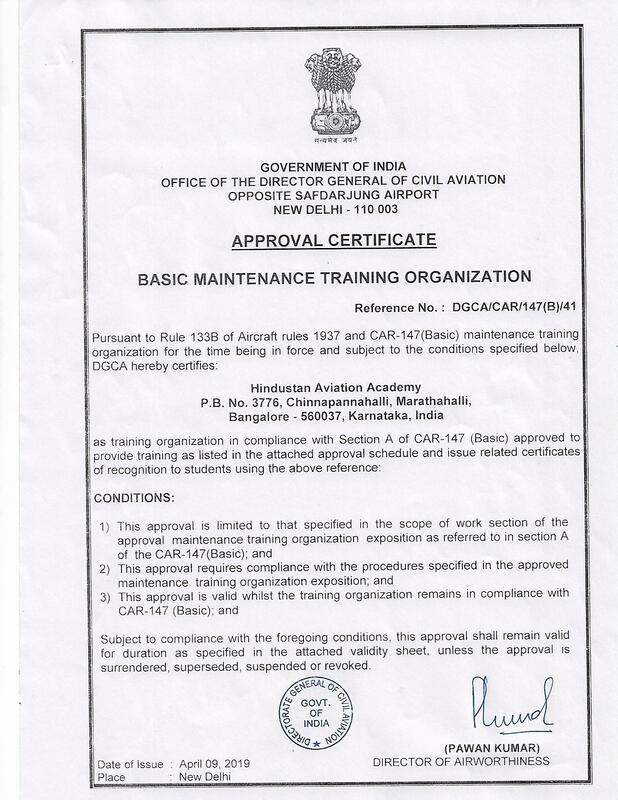 Only qualified personnel called Aircraft Maintenance Engineers, who are issued with such licenses in a particular category by the Civil Aviation Department are only allowed to expedite such work on an aircraft. The Academy prepares the students to appear for the DGCA Module Examinations, in the "B1 - Mechanical" and "B2 - Avionics" stream. The minimum eligibility criteria is a pass certificate in 12th Std with Physics, Chemistry and Mathematics subjects, from a recognizedboard or equivalent. Any candidate who has passed their Diploma in Engineering (Aeronautical / Mechanical / Electrical / Electronics) with the required minimum 50% aggregate in all semesters and no arrears. Any candidate can take up this License course, including engineering graduates or any other graduates who had PCM subjects in their 12th Std. 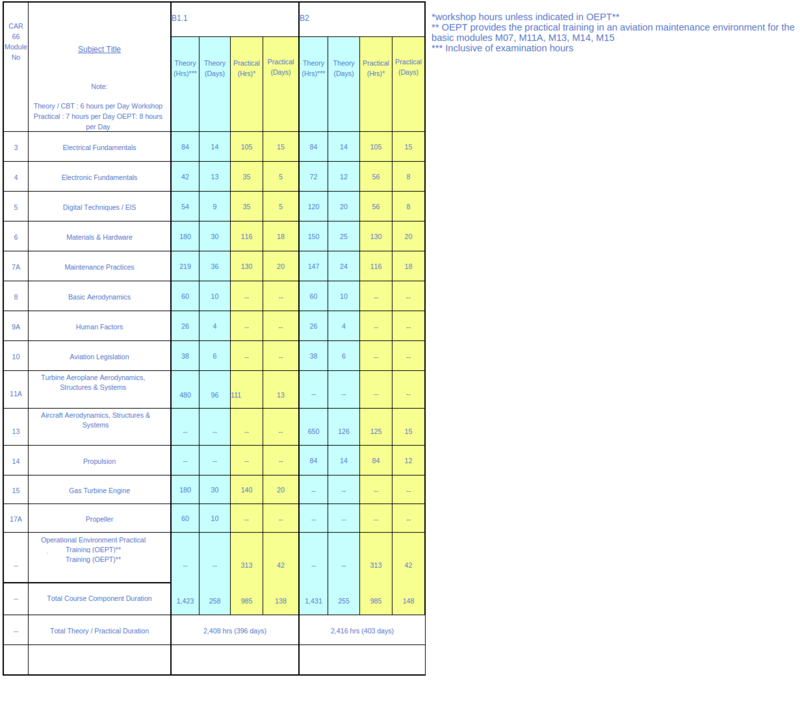 Any Graduate degree holders - BTech / BE. Practical Training is offered on live Aircrafts (such as Airbus, Boeing, Bombardier, Embraer, Cessna, Bell, etc) from the first week to the last week for the full duration of the 3 years course. This is counted as certified work experience. After completion of theoretical training in the campus, the Students are sent to Aviation organizations such as AirWorks India Engg Pvt Ltd., SpiceJet, etc. Hands on experience on LIVE AIRCRAFTS in an Engineering Division with a Certified PERSONAL EXPERIENCE RECORD BOOK signed and sealed by Authorised and Licensed Aircraft Engineers is very valuable when applying for jobs. AME license holders are in good demand as the Aviation industry has been expanding rapidly in India and abroad. Many new airlines have started operations and the civil aviation field has seen a number of new aircraft joining the fleets every month which has resulted in a large number of vacancies for aircraft technicians and engineers. Singapore Airlines has been conducting campus interviews at our Academy and successful candidates are being employed in Singapore from 2007 onwards. Most of our ex-students are well placed in the public sector and private Airlines such as Air India, Airworks India Engineering Pvt. Ltd., Indigo, Go Air, Jet Airways, Singapore Airlines, Malaysian Airlines, Emirates Airlines, Qatar Airways and all other Aircraft owning companies. The Academy assures placements for those who passed all their Modules successfully and possess the minimum required work experience entered in their Personal Experience Record Book. Above all, the student must be determined and motivated to take up any amount challenges involved in the Aviation industry, grooming himself / herself to being a disciplined, well mannered and smart human being to becoming a highly skilled and dedicated aircraft maintenance engineer. Recent Stamp Size Colour Photograph - 10Nos.